This garlic shrimp pasta recipe uses roasted garlic to give the finished dish a milder, nuttier flavor. 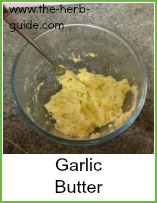 It seems like a lot of garlic - a whole bulb - but it's necessary. It's a good idea to do a few bulbs all in one go, that way you'll have some 'in hand' for when you need it. You could vary this dish by leaving out the shrimp and crumbling in some goat's cheese just prior to serving. 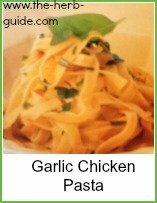 Serve with some crusty bread to mop up the sauce and maybe a sliced tomato salad seasoned with fresh chopped basil. Heat the oven to gas mark 6, 200C. Wrap the garlic cloves in foil which you have oiled. Bake for 20 minutes until soft. Heat 2 tablespoons of the oil and soften the onions - allow them to cook for 15 minutes or so, stirring occasionally. You want them to brown - caramelise - you could add a teaspoon of sugar to help the process if you like. Add the chopped tomatoes and puree. Cook the linguine in boiling water - it's normally around 8 to 10 minutes, but check on the pack instructions. Add a splash of oil to the water to prevent it sticking. Whilst the tomatoes are cooking, remove the garlic from the oven. Squeeze each clove and it will pop - do it over the pan so that you don't waste any. Add the remaining oil to the pan with the shrimp and parsley. Drain the pasta and stir it through the sauce. If you would like a vegetarian option, then leave out the prawns and crumble about 8 oz (225g) of goat's cheese over the pasta just before serving. 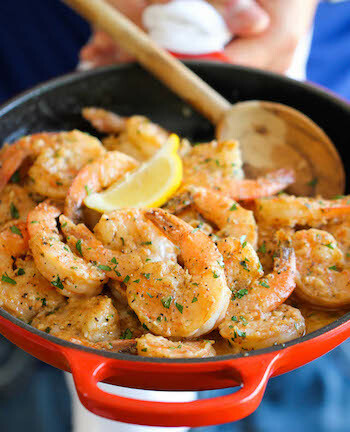 This garlic shrimp recipe uses roasted garlic to give the finished dish a milder, nuttier flavor. You can use frozen or fresh parsley for this dish. 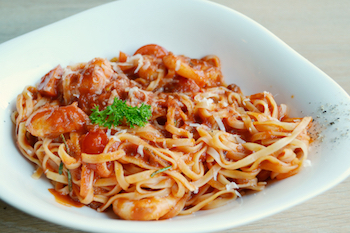 A thin, long pasta is best, either linguine or spaghetti - but whatever you have in the cupboard is OK.
Fabulous garlic shrimp pasta recipe which uses roasted garlic. You could make it vegetarian by substituting feta cheese for the shrimp.